All Four Love: Product Review: We Love Citrus Lane! Product Review: We Love Citrus Lane! We are HUGE Cloud B fans around here. Both Charlie and Ginny sleep with their Sleep Sheep every night and recently I was considering buying a Twinkle To Go, believe it or not! 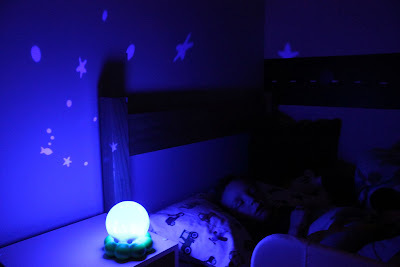 We put it on Charlie's night stand before bed and he hardly listened to his bedtime story - he was so entranced by the stars all over his ceiling and walls. Charlie is a big music buff, so naturally these were a huge hit. He hasn't gotten the hang of the whole rubbing one stick on the other to make a rhythm, but they work as fabulous drum sticks so far. These were gone before we could even get unpacked from daycare. While we didn't get a chance to read any of the stories, a quick flip through and it looks like we'll enjoy all of the stories, poems, and pictures! We're always looking for new things to read, so this is perfect. We can't wait for next month's box!